How was everyone's 4th of July? We enjoyed taking Claire to the beach for her first time seeing fireworks! She really enjoyed herself and so did we. It was fun to see people light fireworks off up and down the beach. The breeze off the water kept the temperature down and hearing the waves at the same time was so relaxing! On a completely different note, I am wearing my new lemon print skirt from Sammydress today. I received quite a few comments on it on my June budget post and I can see why. 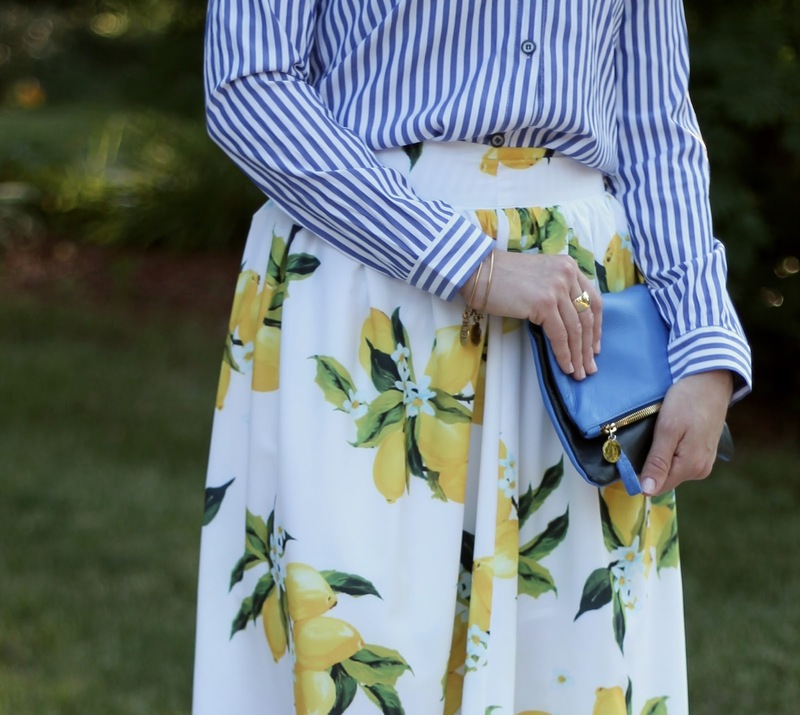 The lemon print is very fresh and summery and pairs well with stripes for pattern mixing! I ended up getting a large and it fits perfectly so size up when you purchase. It's fully lined and the material is silky feeling, not stiff at all, so it has great movement when you walk. I have my closet inventory coming up and I noticed when I was counting how I am such a sucker for a cute skirt! A fun print or colored skirt makes me feel confident. After getting back into running I love showing off a little leg! That is a really fun skirt, perfect for summer! :) Glad you had a great 4th July. This skirt is so cute! The pattern is perfect for summer. Good to know you had a great long weekend. Fun spin on a classic look! This is such a pretty summer look, love the skirt! Lemon prints are so happy and cheerful! This skirt looks amazing on you. And I love the pattern mixing with your striped shirt. Such a pretty look! Such a lovely outfit! Love your skirt! Pretty! What a gorgeous skirt! That print is so perfect for summer. Love that you added the chic button down. Thanks for the link up! That is a fun print skirt, I love it, especially with the stripes! Fireworks on the beach sounds like such a fun time! I think by next year my son will enjoy fireworks--this year he was still pretty scared of the loud noise, poor guy! Stunning skirt Laura, what a score. Very pretty skirt and I love how it looks with your blue striped shirt! I need to keep this in mind to try. So pretty Laura! Such a cute print and I love it with the striped shirt. Wow...I really like this print mixing---and there aren't even the same colors in both (well, except the white). It must be the stripe thing---this is why stripes are so popular, huh? I love this combo! Beautiful style. Such a fabulous skirt! The print is such a happy print! And it looks perfect with the striped shirt! Glad you had a great 4th! There is that pretty skirt again. Lemon prints always remind me of the Stella McCartney collection from a few years back. I guess it has to do with the fact that I loved it so much and I never got something similar to it, which is what I tend to do when the prices are out of my reach. The lemon print is so fun! Love it paired with the stripes! Beautiful look! Love this outfit. I am such a fan of the lemon skirts/dresses but dont own any! Your skirt is so pretty on you. The beach sounds wonderful! Sounds like you had a gerat holiday! I love your lemon and stripe combination! I remember this from your budget post! I love lemons, Autumn has a lemon top and if I had this skirt we could sort of match. ;) I love how you paired it with the stripes! Fireworks on the beach sounds amazing! This skirt + striped top combo is SO fun and ladylike. Love it, babe! 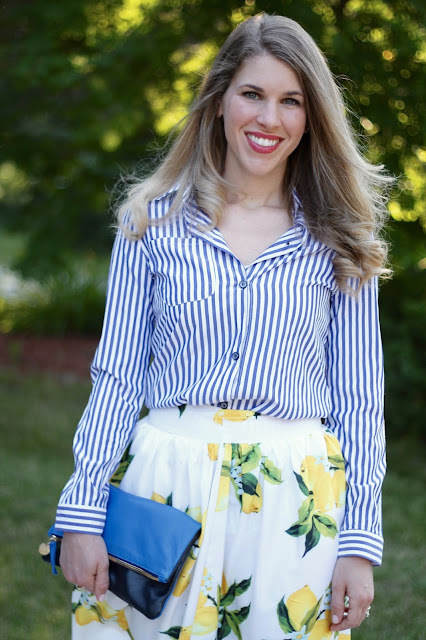 That skirt is so cute and it looks great with the striped button up! What a lovely outfit! I really like where the length of the skirt, and the print is so fun! That print is so cute! I like how you paired it with stripes. love this look!! i'm obsessed with lemons. this is SO pretty. I bet y'all had a great time watching her reactions to seeing fireworks for the fist time - so special! I'm glad y'all had a great 4th. My family did as well :). I LOVE the sweet print on this skirt. It's so charming! I wouldn't have thought to pair it with stripes, but the combination works beautifully. Glad you had a great 4th! Celebrating with fireworks at the beach sounds perfect. I love the lemon print of your skirt, it's too cute. great post, loving that skirt! You look amazing! Glad you had a great time yesterday. Your skirt is fabulous. You're so beautiful! Love that skirt to pieces!!! I love the lemon skirt! It's so cute! And hearing the calming waves on the beach while watching fireworks sound amazing! That was a lovely skirt and I love how your blouse looks with it! I do love the lemon print, it's so fun! A few years ago when I first started seeing fruit print I was very luke warm on it, but now I'm really enjoying it! I love the print mixing you did here. Looks great!